One of the things I love about Christmas time is the scrumptious and delicious food that seems to permeate every facet of the holidays. But, unfortunately, I always seem to be the one who has to prepare it. There are so many wonderful memories to make while attending parties, visiting with family and friends, caroling and viewing the gorgeous holiday lights, that the last place I want to be is stuck in the kitchen through it all. Gooseberry Patch understands this dilemma and has authored a brand new cookbook designed to deliver plenty of delicious holiday fare to your table within 30 minutes or less. Now, I can enjoy all that the holidays have to offer while still partaking in plenty of scrumptious dishes! Keep reading to learn more! 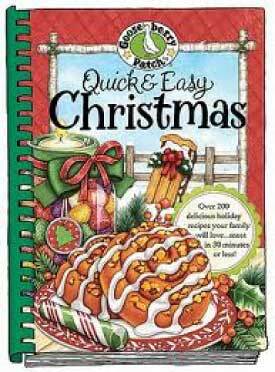 I reviewed the Quick & Easy Christmas Cookbook from Gooseberry Patch, which retails for $16.95. Spend more time celebrating and less time in the kitchen! Quick & Easy Christmas, a new book in the best-selling Gooseberry Patch series, is filled with over 220 easy, inexpensive recipes. They're quick to fix since each is ready in under 30 minutes or starts with just 8 ingredients or less...so simple! Heartwarming holiday memories and clever tips for easy-to-make gifts are also included...features for which Gooseberry Patch holiday books are known. I have to say that I was absolutely delighted with the Quick & Easy Christmas cookbook from Gooseberry Patch. This easy-to-read cookbook offered plenty to make your holiday season merry and bright. There were so many tantalizing breakfast ideas, desserts, soups, appetizers, etc. that I hardly knew where to begin. It seems that every time I turned a page, a new delicious option was staring up at me. Since my husband doesn't share in my love of chocolate, I decided to try a dessert from the Gooseberry Patch cookbook that I thought he'd really appreciate: Eggnog Fudge! 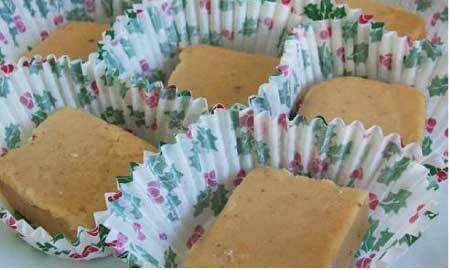 Eggnog is one of my husband's favorite holiday traditions and I loved how the eggnog fudge recipe seemed to be a new twist on a classic recipe. Combine sugar, eggnog, butter and corn syrup in a heavy 4-quart saucepan. Cook over medium heat, stirring constantly, until mixture comes to a boil. Wash down crystals from sides of pan using a pastry brush dipped in hot water. Insert a candy thermometer into mixture. Cook, stirring occasionally, until mixture reaches the soft-ball stage, or until a candy thermometer reads 238 degrees. Remove from heat and cool, undisturbed, until temperature reaches 190 degrees, about 15 to 18 minutes. Stir in nuts, cherries and vanilla. Beat with a wooden spoon until fudge thickens and just begins to lose its gloss, about 5 to 8 minutes. Line a 8" x 4" loaf pan with aluminum foil; coat with butter. Pour mixture into pan. Cool completely; remove from pan and cut into squares. Makes one dozen. My husband absolutely raved over this recipe and wants me to make it for him again very soon. It's going to be a tough choice though. There are so many perfect comfort food recipes included in this Gooseberry Patch cookbook, that I don't want to already start repeating one of them! Well, it looks as though this is going to be a long, fruitful winter with plenty of delicious dishes to try, thanks to the Gooseberry Patch Quick & Easy Christmas cookbook. Disclosure: I received the Quick & Easy Christmas Cookbook from Gooseberry Patch in order to facilitate my review. No other compensation was received. This product review is based on my own personal experiences with this item and is completely honest and objective.